When the clocks fall back and darkness descends well before dinnertime, I always feel an enhanced sense of urgency about preparing our evening meal. 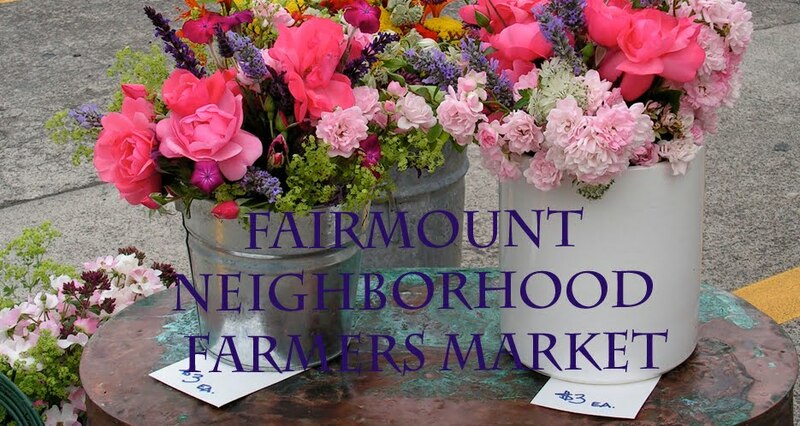 And no longer can one rely on fresh tomatoes or basil to drive the show. Instead we need to hope for inspiration from root vegetables and greens. 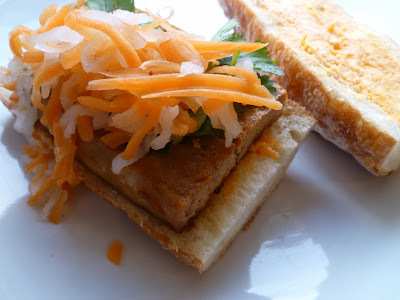 One recent favorite solution is these tofu banh mi sandwiches. The tofu, from a Mark Bittman recipe, is braised in a concoction of caramelized sugar and soy or fish sauce that produces addictively flavorful slabs. The sugar caramelizing step seems a bit tricky, but every time I've made these, the unpromising sugar crystals at the beginning have dissolved during the braising step and all has turned out well. The Slate banh mi recipe adds a step of pre-freezing the tofu to give it a firmer texture. 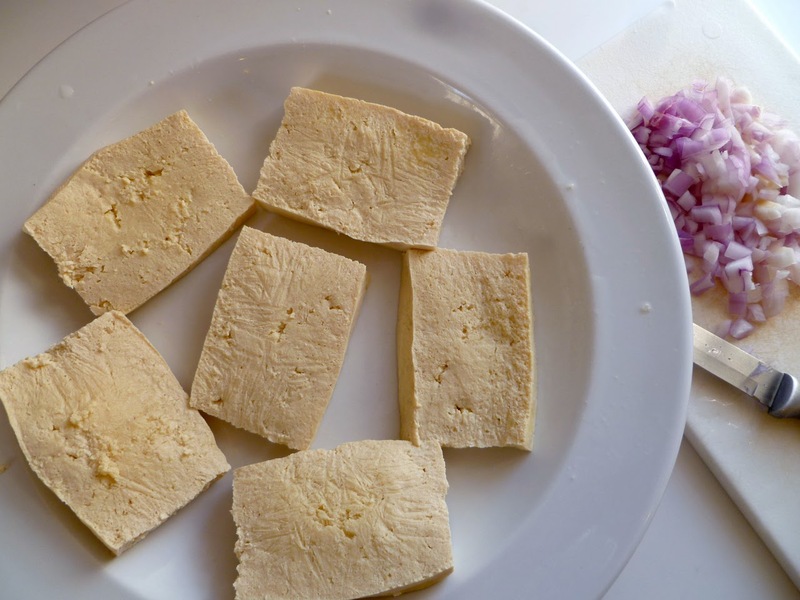 I've taken to keeping a stash of sliced tofu in my freezer at all times so that we can make these sandwiches on demand (just pull them out in the morning, or thaw in a microwave). The classic garnish for these sandwiches is the Vietnamese quick pickle of julienned carrots and daikon radish called dau chua. On a family trip to San Francisco last spring, my son discovered a passion for these pickles, so I've been making them quite frequently based on a recipe from Hot, Sour, Salty, Sweet: A Culinary Journey Through Southeast Asia. They can be made ahead, but are also easy to whip up along with the tofu. Once you have the pickles and tofu prepared, then all you need to do is slather some good baguette with butter or mayonnaise (if you like, mix in some sriracha sauce), then layer on the tofu and dau chua, and add some cucumber and jalapeno slices and springs of cilantro, if you have them. Even if it's the end of the week and your supplies are low, I suspect that you've got carrots in the crisper and with that tofu in the freezer, you can make a simplified version of these sandwiches. Heck, you could even put them in a tortilla. No matter what, be sure to eat with plenty of napkins. 1. First prepare the pickled carrots and daikon. Scrub the carrots and peel the daikon. 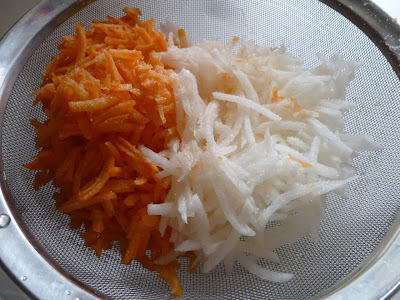 Trim and julienne them or coarsely grate them (I use a food processor for this and it goes very quickly). Toss with the salt, place in a strainer, and allow to drain for 10-30 minutes (depending on your time schedule). 2. Meanwhile prepare the pickling sauce. In a small saucepan, combine the sugar, rice wine vinegar, and water and warm just until the sugar dissolves. Allow to cool completely (you do not want to cook the vegetables). 3. Quickly rinse the drained carrots and daikon and squeeze well. Combine with the vinegar sauce and allow to marinate until you are ready to serve, or refrigerate and store for a few days. Taste before serving and add a little more salt if desired. 4. 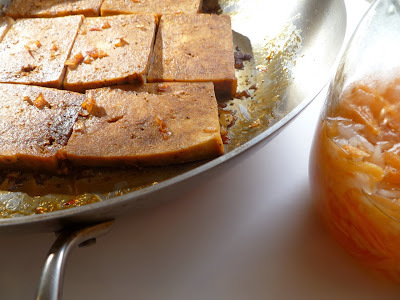 To make the caramelized tofu, thaw your pre-frozen tofu slices and drain off any liquid they release. Warm a large skillet over medium-low heat. Put 1/3 cup sugar and 1 tablespoon water in a large skillet, stir to mix, and then put your spoon down because you should not stir the sugar as it melts or it will crystalize. Instead, let the sugar warm and bubble and gradually turn a golden brown while you shake and swirl the pan occasionally, about 10 minutes. Now take the pan off the heat. Slowly drizzle in the soy sauce or fish sauce, then add the shallot. Return to the heat and cook, stirring often, until the onion is tender, about 4 minutes. Add the thawed tofu and the black pepper and cook, turning the tofu occasionally, until it has absorbed most of the sauce, about 15 minutes. Stir in 1 tablespoon rice vinegar and remove from the heat. 5. Prepare the sandwiches. Cut the baguette into lengths a bit longer than the tofu slabs and cut horizontally. Slather the bread with butter or mayonnaise (mixed with a bit of sriracha sauce if you like). Layer on a tofu slab, a spoonful of drained pickled carrot and daikon radish, cilantro leaves, cucumber and jalapeno slices. Enjoy.